Blog Plaque vs. Tartar: What’s The Difference? 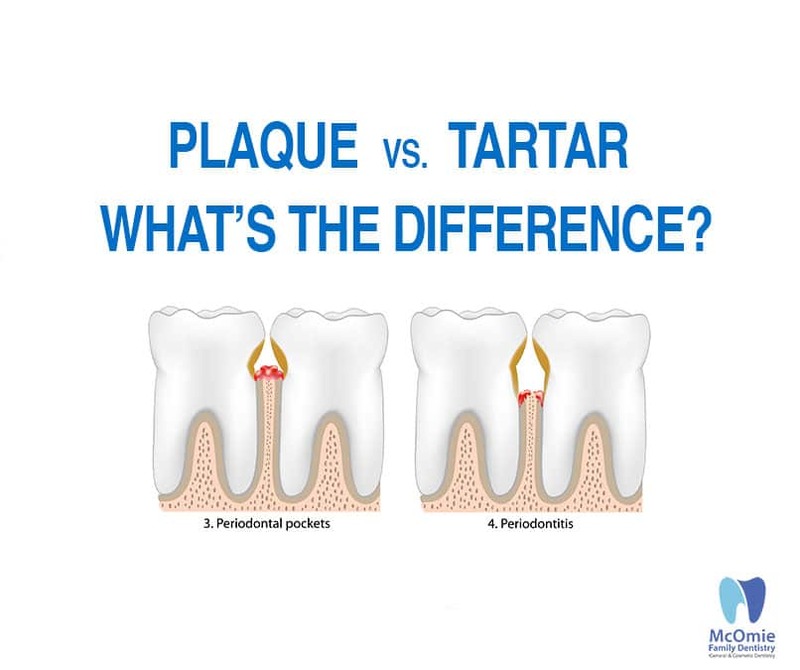 WE OFTEN GET THE QUESTION from our patients at McOmie Family Dentistry, “What’s the difference between plaque and tartar?” Many people think they are the same thing. There is an important difference between the two, however, and it can help explain just why a daily oral hygiene routine is so crucial, as well as twice-yearly visits to your dentist. Dental plaque is that soft, sticky film that builds up on your teeth and under your gums throughout the day. And guess what? It contains millions of bacteria! When you eat—especially carbohydrates or sugar—you’re not the only one getting a meal, so are the bacteria on your teeth. After “eating,” these bacteria produce acids that erode your tooth enamel and cause cavities. Plaque is soft you can scrap it off your teeth with your fingernails if you want. Brushing properly will remove it. Plaque is the precursor to tartar. So if that’s plaque, what’s tartar? Tartar is what accumulates on your teeth when plaque is not removed. If plaque is left on your teeth for too long, it will harden into tartar and is much more difficult to remove. In fact, tartar can only be removed by a dental professional–you can’t get rid of it with regular brushing and flossing. Tartar removal is one of the reasons that visiting your dentist every six months is so important! Scarlet, Ashley and Kristin are literally pros at removing tartar without causing pain for the patient. No matter how great your oral hygiene is, plaque and tartar formation are inevitable. So come in to see us every six months! Our job is to help you maintain a beautiful, healthy smile that’s plaque- and tarter-free! The old saying is true an ounce of prevention is worth a pound of cure! Thank you for your trust and loyalty. Give us a call at 423-899-1112 and make an appointment for a good cleaning. Remember the end of the year will be here before you know it. Use your dental benefits before they expire.